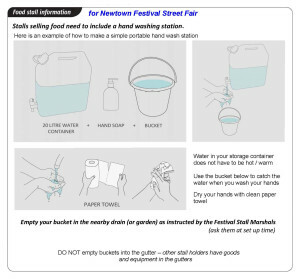 (See below for details) NEW for 2017: HANDWASHING at YOUR STALL: The Council Environmental Health Team now requires that all Food Stalls at the Newtown Festival provide handwashing as part of the stall set up. When you tick “selling food” on the booking form you will automatically be charged an extra food stall fee. In 2017 this is set at $60 per food stall (the same as last year) . The additional Food fee paid goes towards paying for recycling and rubbish collection, which costs thousands of $$$ each year. Food and drink stalls generate the majority of the Fair’s recycling and waste.If the food that you sell is all pre-packaged and is not intended for eating at the Fair, we can reduce this fee. Please contact us to explain your situation. The Festival team are keen to do even better in 2017 – please help us achieve this! Food stalls often ask to be in Riddiford St, particularly zone B. However although there are a number of food stalls in this zone they are local businesses opening outside their own premises. Other food stalls are mostly grouped in food precincts – Emmett St, Rintoul St, Wilson St, Constable St, Donald McLean St. There also a few in Newtown Ave and in South Riddiford. 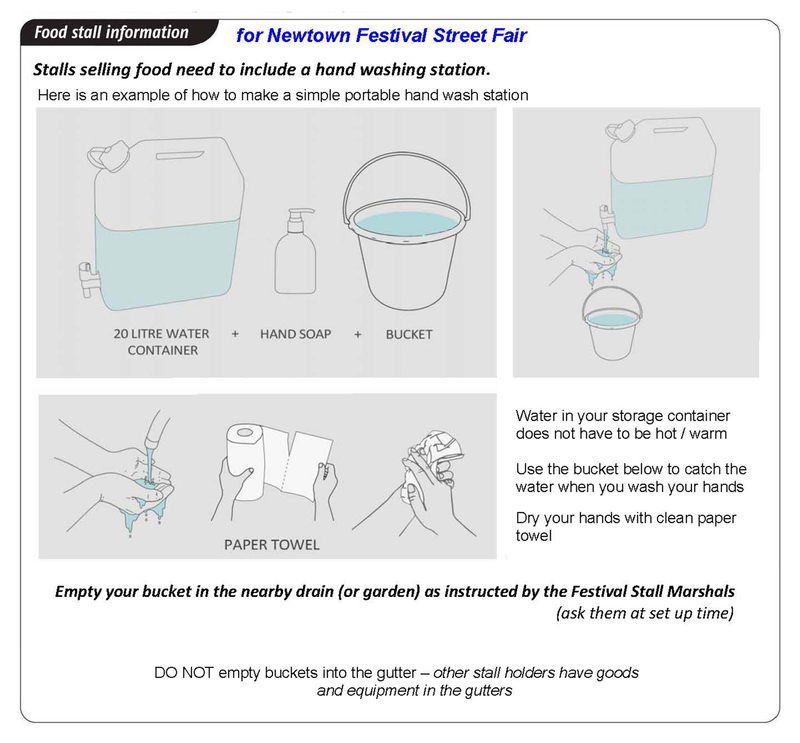 See below for details NEW for 2017: HANDWASHING at YOUR STALL: Because of the scale of the Street Fair and the density of the crowds the Wellington City Council Environmental Health Team now requires that all Food Stalls at the Newtown Festival provide handwashing as part of the stall set up. Local business who have a food stall outside can use the handwashing facilities in their premises behind. Additional to handwashing at your stall, food stalls that are not part of a local business are clustered in precincts near where there is also hot water available for hand and utensil washing. Nearby there will also be toilets stall holders can use. Your stall site information packs will show you where the nearest of these extra washing facilities and toilets are located. In the morning, when you set up, ask your fair Site Marshal to point these out to you, and ask them to show you where you can empty a water bucket (if your hand-wash station is using one). FOOD FORM: Also because of the scale of the Street Fair Wellington City Council requires Newtown Festival to register all the stalls selling food and/or drink. This includes stalls selling sweets, cakes, jams, or chutneys. Food stallholders at the Festival are required by the Environmental Health Team to confirm that they meet prescribed safe food handling requirements, and to describe how they will wash their hands at their stall. Even if you already hold a food licence or have a Food Control Plan registered with Council everyone is still asked to complete and sign the Safe Food Handling form. We sumarise what you tell us on the form and prepare a map of the whole Fair showing all the foodstalls for the Environmental Health Team Inspectors who visit to check your foodstall set up on the day. Newtown Festival doesn’t charge stallholders the cost of this extra administration. A reminder about completing this WCC paperwork will be emailed to you when you apply for a stall site from which food will be sold. It will instruct you to download, print and fill out the WCC Safe Food Handling Form (PDF, 1,111KB). Please then return your completed signed form to the Newtown Festival Office, a scanned copy by email is ideal. If you are selling cakes, chutneys, or jams that are sealed and were prebaked or precooked please still fill out this Food Handling form and explain that there will not be any food preparation done at the Street Fair, and explain that because all your food is wrapped and sealed you will not need a handwash station at your stall. Send us supporting documents: If your set up has a Mobile Food Licence, or a Food Safety Programme, or a Food Control Plan, or you have a personal Food Handling Hygiene Certificate (or similar ), then please send us a copy of these along with your completed Food Handling Form. We provide WCC with all your details. Before Fair Day the Newtown Festival files a set of everyone’s completed forms with WCC for temporary licence approval processing. If you have any questions about the safe food handling requirements, setting up a hand-wash station, or about filling in, or returning, the form please feel free to phone the Newtown Festival on (04) 389 7316, or 021 4169731.